A new outpatients unit has been opened at a hospital in Birmingham. 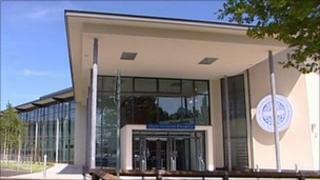 The department at the Royal Orthopaedic Hospital has cost nearly £8m and taken four years from planning to completion. The new facility includes 24 consultation rooms, treatment rooms and an ultrasound suite. The unit can see 350 to 400 patients a day. The hospital, which is 102 years old, treats patients with bone and joint disorders at its Woodlands site in Northfield. The Royal Orthopaedic Hospital has been at the Woodlands since 1909, the site having been donated by the Cadbury family. For a number of years the outpatients department was based away from the main hospital building on Broad Street in Birmingham city centre. In 1992 it was moved to the main site in Northfield but was housed in temporary accommodation. Director of Nursing and Governance Lindsey Webb said of the new outpatients department: "It was a particular area in the hospital where we knew our patients' experience could be better and the feedback that we had from patients was that the surroundings could be improved upon."